It appears I am in the Candy Fairy’s good book. The plan was fudge. The result was caramels, purely by accident. Things do not always turn out the way they are supposed to, especially when working with sugar. Fire morphs it into such different forms. You really have to do know you’re doing. Of course, it helps to have the right tools (yeh, like a candy thermometer) and good instructions (e.g., recipe) which you are committed to follow. Our kitchen is very well stocked with all manner of tools and gadgets…juicer, mandoline, food processor, Vitamix, dehydrator, etc. We even have an OXO avocado slicer (which we never use). But a candy thermometer, we have not. It is not a necessity. Grandma did not have a candy thermometer. So, why would I need one? All I needed was a cup of iced water and a few drops of hot fudge to do the necessary testing. Had I done what my own recipe says to do, I would probably have fudge now. But, I do not follow instructions as I should. The plan was to make a big batch of Island Fudge for my friends at Scott Hawaii to thank them for treating Daisy and me to our favourite flip-flops. In my defense, I did test to make sure the fudge had reached the soft-ball stage. Once the fudge cooled, it was just too soft and would not hold up under the knife. So, back onto the fire it went. It didn’t help that I was distracted cooking dinner while the fudge was bubbling away. The colour looked good, lots of nice bubbles at the top of the big pot, all was going well. So I thought, anyway. It poured beautifully into the pan and chilled in the freezer overnight. The next day, this “fudge” was so hard, it nearly broke the blade of the big knife. So, what I’d promised the folks at Scott was fudge, but what they were going to get (with profuse apologies) was caramel, hard as granite, but devilishly buttery. Pretty little black specks proved real vanilla beans were used. 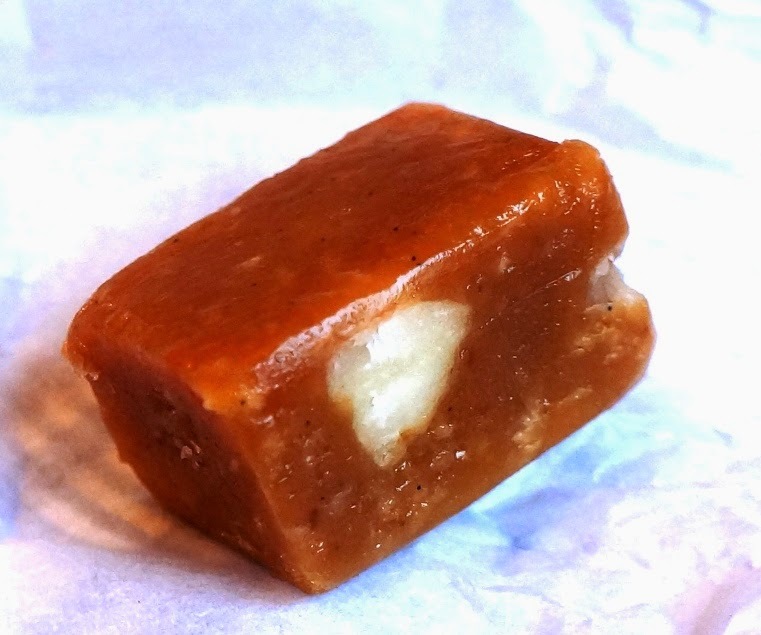 These accidental caramels tasted like old-fashioned candy parlour toffee SO good that I did not care if they yanked all the fillings and crowns right out of my mouth! Cutting this stuff was a serious challenge. So, in came the cavalry – Hubby to the rescue. Shawn patiently cut the caramel block into small, bite-sized bits. Then, Daisy and I wrapped them up in parchment paper, singing “Rolly, rolly, rolly. 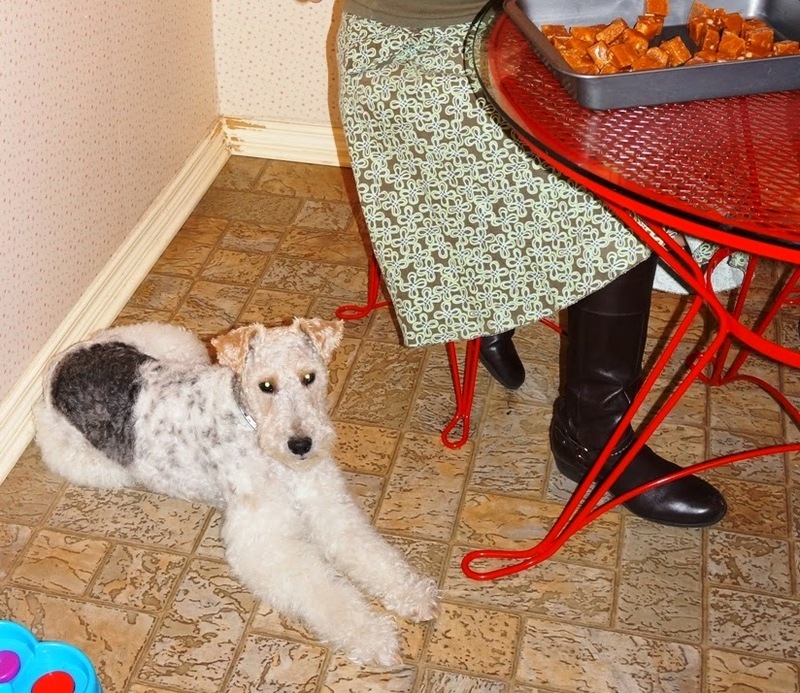 Twist aaaand twist.” It was a whole family affair, with Milou resting underfoot, ready to catch any bits that may find their way off of the table, headed toward the floor. We had a blast, working together that Friday night. While the sweeties sat in the pan waiting to be wrapped, their outer layers turned into crumbly, crunchy crystals, a bit like the way the tops of brownies become in the oven. It was like some kind of sugar magic. The insides softened up and became just the right amount of chewy. They were just perfect and I was so relieved. Now, I want to tell you how to make these Accidental Caramels, because you really do want to, even if you do not know that you do. Follow my original recipe for the Island Fudge, but instead of heating the concoction to the soft-ball stage (~235*F), let it go all the way to the firm-ball stage, between 240-245*F.
If you do not have a candy thermometer, have a cup of iced water nearby. When you drop the sugar mixture into the iced water and it solidifies, you’re there. Pour it into a 9x11x2 pan lined with foil and pop it into the freezer overnight. Cut parchment paper into about 100 2″x 2″ strips. Let it the block reach room temperature before you try to cut it. 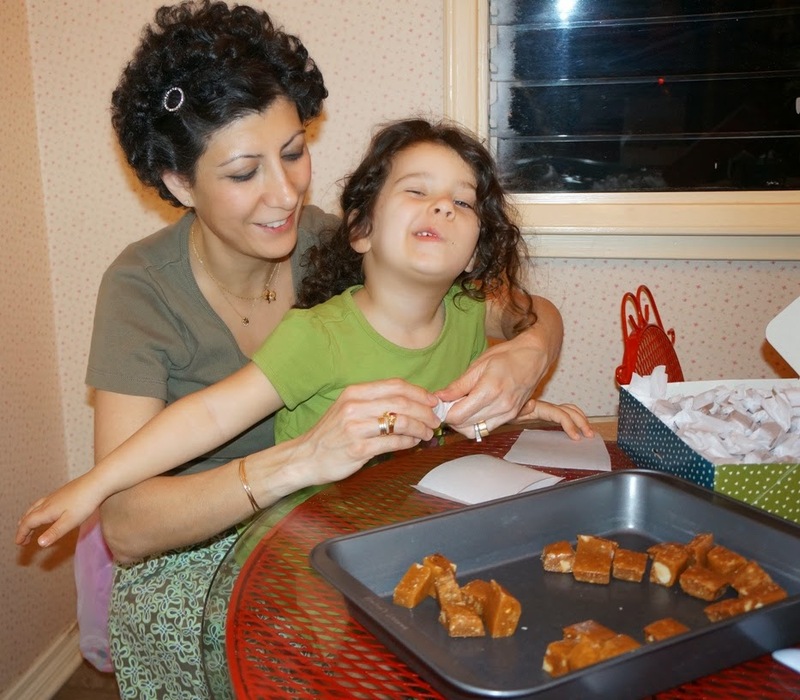 Cut the caramels into strips, then use kitchen shears to cut them into 1/2-inch cubes. Separate them from each other and let them sit another 30 minutes before wrapping them in parchment paper. If that all sounds like a lot of work, today is your lucky day. Enter in our drawing below. Daisy and I will make a batch just for you. (OR) You could win yourself a snazzy pair of Scott Hawaii flip-flops, the real thing. (AND) There will be THREE lucky winners. Scott Hawaii has generously offered TWO pairs of their heavenly slippahs. What are you waiting for? Go for it! Good luck! Thank you to everyone who participated and very special thanks to the Scott Family. For the Scott flip-flops, Kassandra Lynn and Robin Fay! For the box of homemade caramels, Tamara Bennington! I’ll contact you ladies via email to work out the details. Alooooooooooooooha! The candy looks delish and the sandals are so cute! Hey these came out great! It's a happy accident. I love accidents like that. Cute sandals. Wish I could enter. And thank you for the giveaway how exciting! My slippahs will take me to the dog park with Riley! I have to say that it is funny that accidents can be extra delicious! Btw, the widget has gone to sleep when I was in your page… hmmm!